Black Blue Cardinal Red - New! Fawn - New! Green - New! Off White Orange Peel - New! Pink - New! Pecan Leaf Purple Sage - New! The Pranayama Cotton Yoga Bolster by Yoga Accessories is a small and long yoga bolster. This is a perfect yoga bolster for Pranayama Yoga or breath work. Please note the actual size of the bolster before purchasing: 25" long x 3" high x 6" wide (It is over 2 feet long and half a foot wide). This restorative bolster is commonly placed under the length of the spine to promote expansion of the lungs for deeper breathing. Place the bolster under the knees in Shavasana to deepen relaxation. Our bolsters are supportive yet firm and filled with 100% cotton batting. The zippered cotton cover is removable and machine washable. There are two handles — one on each end — for easy transport and adjusting. I am just now noticing that these pranayama bolsters come in so many colors - they are a great density, size (accommodates many body lengths/sizes) and very well made! 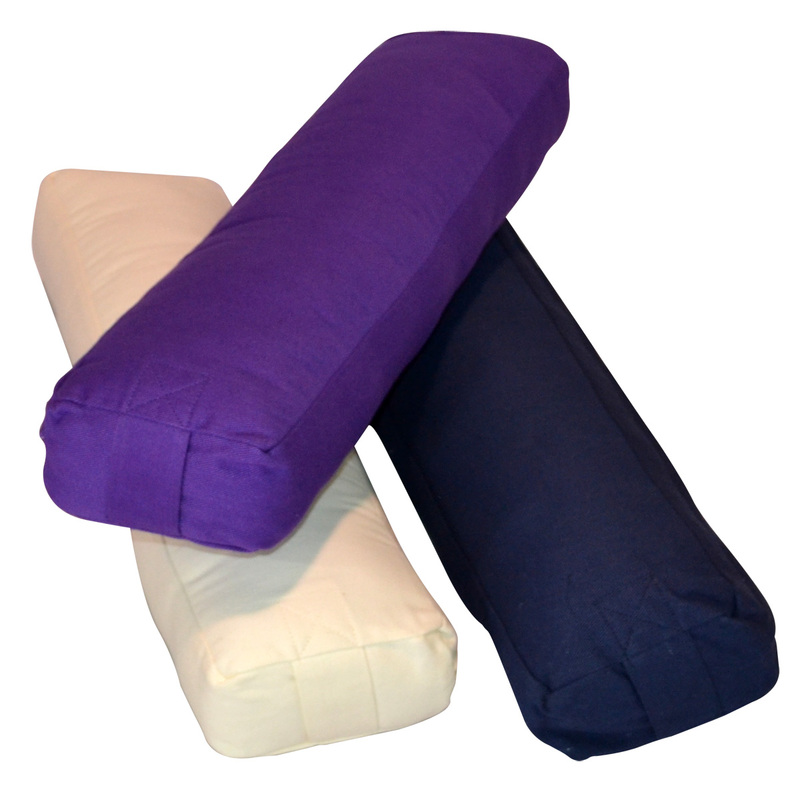 Quality bolster and a good value, holds shape, nice and firm for restorative poses. Especially nice in supine position vertically supporting spine or horizontally under shoulder blades for opening chest. These bolsters are the perfect size to help with adjustments and for restorative poses. Great quality and beautiful colour. Perfect size for some of my more petite clients who couldn't use the larger bolsters. Great price and quality! Love the Red! This bolster is perfect ! I have been able to use in a wide variety of restorative positions. Great for Yin Yoga and Yoga Nidra. I have the dark blue ones. They tend to attract dust, so i keep a lint roller handy to use on them before a class. I like the slimmer profile of this bolster. I can lie on it lengthwise for back relaxation. Very nice bargain bolster. I love the bolster! It is well made and perfect for sitting on for meditation and pranayama. The price was excellent, too.